Need we say more? Actually, yes. In a world where consumers are faced with a dizzying amount of choice, and where (almost) everybody has at their disposal the tools to publish and broadcast in real time, it’s extremely hard to get noticed or heard above the noise. Only messages that cut through, connect and clarify will be the ones that are effective. The word “solution” offers none of those qualities. It is generic, sterile and ambiguous. Because of its ridiculously wide scope, it is a word that actually limits. Let me illustrate. A lawnmower salesman may be offering the most amazing piece of lawn care equipment to hit the market. To local landscapers, he offers an attractive “solution.” But to someone living in an tenth floor apartment he offers no “solution” at all. Solutions really have no inherent value. They only derive value in the context of the problem they are solving. Using the word is absolutely meaningless without an understood context. Check out these real cases in point that I’ve come across while out and about. So if you should find yourself with a problem of some sort, which one of these companies should you turn to for a solution? They all claim to have them. Have they clarified things for you at this point? Not at all. Effective communication is hard work. It is the result of rigorous thought, decisive positioning and creativity, and it involves a considerable amount of risk. I have said that a mission statement should turn some people away and a vision statement should inspire whoever is left. Similarly, your marketing messages should either repel or compel consumers. Whoa! Wait a minute! Did I just say repel consumers? Yes. Because not every consumer is your particular customer. Not everyone with a pulse has the problem or need or desire that your product or service satisfies. And the more time you spend with people whom you can’t actually help means less time with the people who need, who want, and/or who are motivated to buy your products or services. We’ve clarified things a little since then. And we’ll continue to refine our own messages in our quest to practice “authentic marketing” and “to help landscapers, builders and professional trades promote their companies effectively.” Along the way, we’ve learned some hard lessons and we pass them on to you here. 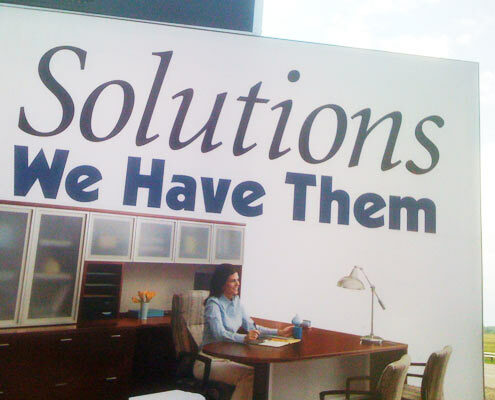 If your tagline or any of your messaging includes the word “solution,” drop it immediately. Use concrete language that clearly describes your organization, what it does and who it does it for. And don’t be afraid to alienate a few people along the way. They were likely never your customers in the first place. Should they be interested in the future, they’ll appreciate the fact you were honest with them in the past. Be careful that in the quest for brevity you don’t take a wrong turn and end up at ambiguity. Finally, if you’re really struggling to articulate your value proposition to the market it may be an indication that you need to go back and take a hard look at your business with some strategic planning or positioning analysis. It is not easy. It is not for the faint of heart. It requires thought and tough decisions. There is risk. But the market does reward those who care enough about their customers to communicate to them clearly. * estimates range from 350 – 3000 per day but many of these estimates were made in the 1990s, pre-dating the internet and mobile devices. I haven’t found any solid data to support a more accurate number – so let’s just say it’s A LOT.